Lost a little steam last night and couldn't finish day 3, which, incidentally, is sort of how day 3 itself felt. After the Avery excursion, I still had enough juice to cram in a stop at Boulder Beer, but was apprehensive, knowing that the product probably wouldn't match. Maybe I set myself up from the start, but despite its grander exterior, larger tap room and more global following, Boulder Beer is no Avery. Pass Time Pale Ale: "Graham cracker? Sweet, but not good. Whatever. 2.5"
Sundance Amber: "Nothing to say. 2.5"
Sweaty Betty: "Frozen pea aftertaste. Banana is there. 2"
Hazed and Infused: "38 IBUs for dry hopped? So subtle. 3.5"
Planet Porter: "Yes coffee. Nothing else. No depth. 2.5"
Mojo IPA: "Tangy orange tangerine. 4"
Cask Planet Porter: "Bigger head. Flatter. Warmer. Less flavor. 2"
So there you have it. 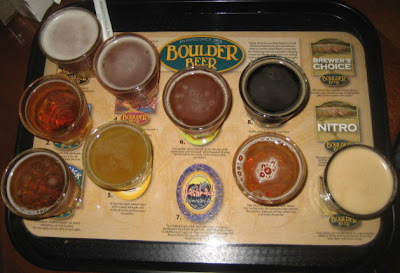 Boulder Beer may as well rename itself Boulder Below Average Beer. I'd like to get a bottle of each of these and systematically refute the brewery-given descriptions of each. Ugh. Maybe I'm giving Boulder Beer a hard time. They were one of the first microbreweries and obviously have had tons of success. The Mojo was delish. They've probably had other specialty beers throughout the years that are worthwhile. I just haven't had any of them. Have and of you? One final stop for the night at the Mountain Sun Pub and Brewery for dinner and what turned out to be just one half pint of suds. I was stuffed with beer, a bit worn out from the heat and ready for a nap. There were plenty of options to choose from, and I took a stab and went with the nitro tap Illusion Dweller IPA. The results were not what I had in mind. This was not an American IPA, and there was not literature telling me so. Had the sweetness of a British IPA and was flat as could be. There was a certain amount of dry bitterness, but it couldn't offset the sweet flatness. A disappointment and not how I wanted to remember a well-reviewed brewpub. With that said, the staff was incredible and accommodating, we were greeted with a free appetizer, and though the service and speed were fine, the manager knocked a third of our bill off because of some minor, everyday mishaps. I would go there again if I found myself back in Boulder. And do a little research beforehand. I have good memories of Mountain Sun. A bit of a hippy joint with a woman openly feeding her baby, and not with a bottle. Loved the painting on the walls. Kris, you are Right On, daddy-o, Mountain Sun was a stab from the past...a great place to toast the 40th anniversary year of Woodstock! Great to know such places exist, and are run by 20- and 30-somethings, not pathetic 50-yr.olds hanging on to the past (who knows, Mt. Sun is probably owned by a 50-something former hippie turned wealthy entrepeneur. The food was good but not great, the beer was good, but the atmosphere and service was outstanding. Okay so now you're just trying to make me feel better. Totally down playing Boulder so I don't feel bad for missing it : ) Typically you won't get any IBUs from dry hopping but that being said I am surprised that Hazed is only 38 IBUs. I always thought it was a much more bitter beer than that. Guess my tastes have changed too. Glad to hear you got to Mountain Sun. I totally get the burned out beer palate, I had it a couple of times out there. Very un-me. I blamed it on the altitude. I'm not a beer science guy like you are, so I didn't know dry hopping had little effect on the IBUs. Even so, I was surprised at the low number. I felt the altitude on the hikes, never thought of blaming it for my sluggish taste buds.